Kindlet 200 is the latest version of the market leading Kindlet. 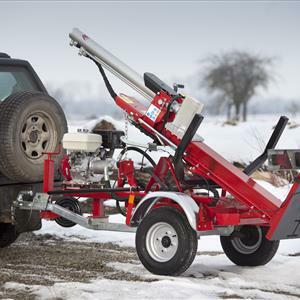 It converts timber off-cuts, pallet waste and round logs into kindling. Its benchmark two second cycle time is capable of processing 1.3 solid cubic meters per hour, equivalent to 120 nets. Kindlet 200 has a compact design incorporating the ergonomic improvements that follow, to ease and improve the speed of operation, boost efficiency and reduce maintenance costs. • The machine is fully guarded to ensure operator safety whilst allowing the conversion process to be observed, the top guard hinges above the splitting area allow the operator to raise the guard. • Hinges are fitted at the rear of the machine aiding user and servicing accessibility. • A changeover lever fitted at the front of the machine allows for quicker and easier user operation. • The grease line station at the front of the machine allows for faster maintenance. • The 3 point linkage and forklift pockets improve portability. A wide range of power and bagging options are available to suit individual needs.